The barbershop, once considered a place of the past, has come back around as an essential grooming parlor for young hipsters in Korea. Many of the newly opened shops are operated by young barbers who garner customers by featuring trendy hairstyles. 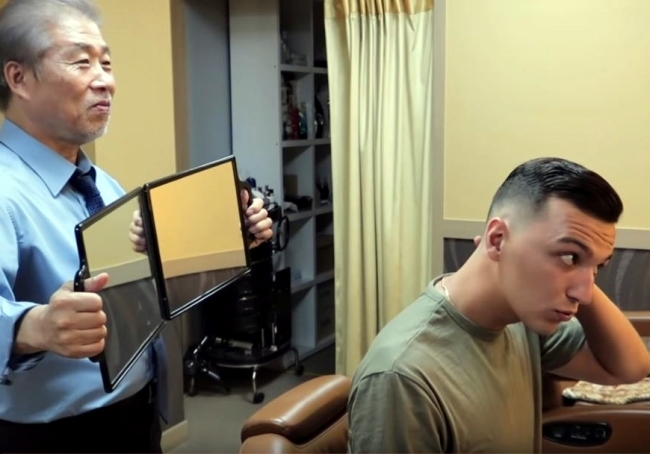 The professional trimming skills of more aged barbers, however, have caught the eyes of the youth, as videos of YouTubers experiencing old-school barbershops in Seoul have gone viral online. YouTube creator Art from the channel “That Russian Guy” is one of the customers who has raved about master barber Charles’ skillful cutting. 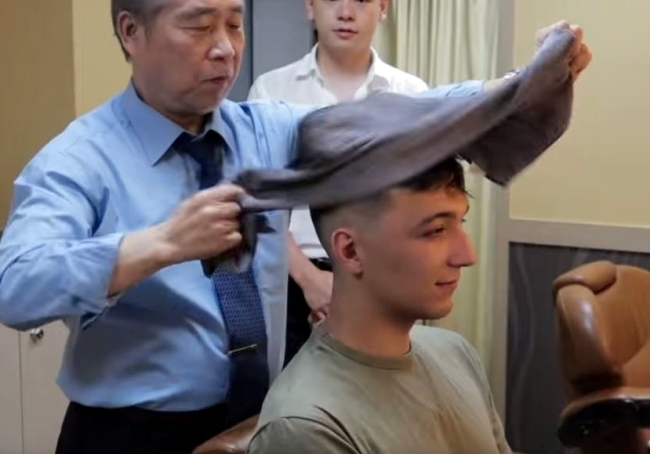 In Art’s video, titled “The most BADASS barber in Korea,” the creator has Charles spiff up his hairstyle. The grooming guru with a 53-year career had worked in various hotels over the past 40 years, and recently opened his new shop in the Hongdae area, a young and hip neighborhood in Seoul. The creator sat on a barber chair, and Charles started the grooming by first spraying water on his hair. With a trimmer, comb and scissors, the master carefully and meticulously cleaned up the cut to make sure Art’s hair looked its best. Then he dipped Art’s head into the sink and shampooed his hair with an abundance of foam, and Charles gave the finishing touches with a hairdryer. “I usually keep my eyes closed for 99 percent of my haircut because I don’t want to see myself until the job is done,” Art said. “And when I looked at my hair for the first time there,” the YouTuber trailed off, sighing with satisfaction, recalling the moment he encountered his new hairstyle done by the master Charles in the mirror. The YouTuber also mentioned the prices of the barber chair and the trimming equipment, 27 million won ($25,000) and 11 million won, respectively, to highlight the investment and show how dedicated and passionate Charles is for his art. 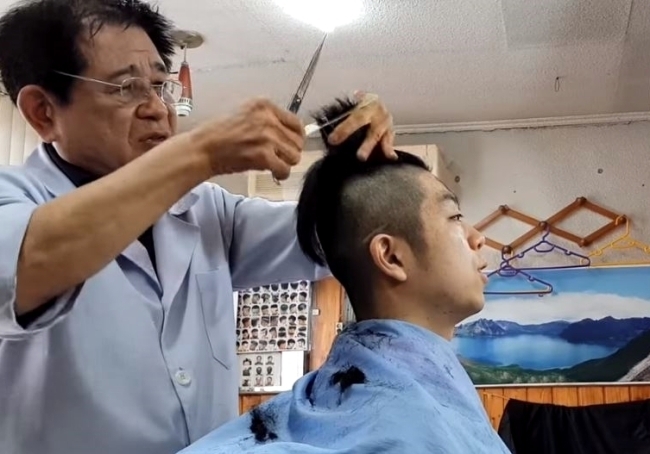 Another YouTuber, YoungAlNam, got a haircut in an old barbershop located in the old downtown Jongno district of Seoul. “Today, I’m going to try the European-style haircut that’s in trend these days,” the YouTuber said. He entered the shop and asked the aged barber if he could try an undercut quaff. With the simple request, the professional barber finished the haircut without a hitch. “I love the new hairstyle! 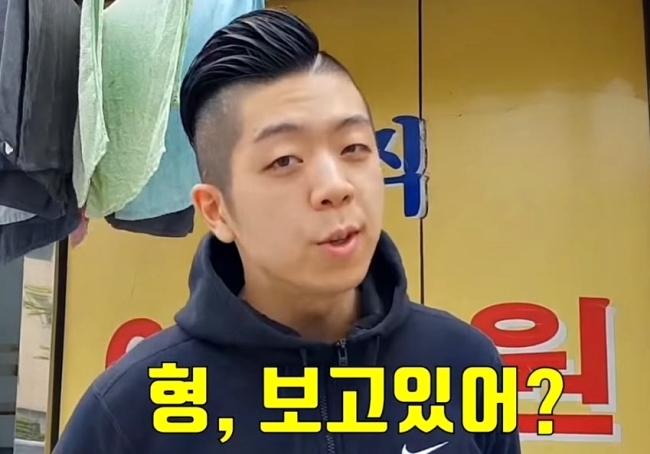 I’ll come to this barbershop every three weeks from now on,” the YouTuber said, paying the trimming cost of 10,000 won. The videos of YoungAlNam and Art have garnered more than 600,000 and 190,000 views, respectively, drawing massive attention from young Koreans. “I feel embarrassed of myself as I had expected that the elderly barber would ruin his hairstyle (before I watched this video). The barber perfectly groomed the hair according to the style (the) customer ordered, even though he had never heard of such style before. The professionalism comes from 40 years of his career I guess,” a YouTube user commented on YoungAlNam’s video, receiving more than 1,700 likes from others. “I’m shocked. The barber is a real master,” another YouTube user added to the comment, saying he would visit the parlor someday. “Many young people tend to go to the beauty salons for the haircuts, but old school barbershops sometimes offer better trimming services than the salons. Also, those barbershops are more quiet and cheaper,” said another user.